Mar 2015 - 'Climate Change turn on or turn off?' - PfSC conference - agrandstandfortheenvironm's JimdoPage! 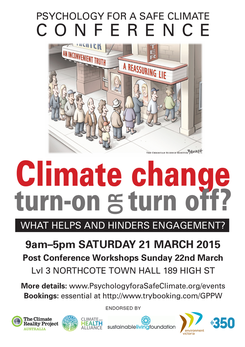 We are delighted to let you know of Psychology for a Safe Climate Conference and Workshops coming up on 21st and 22nd March. Some of you may have had the privilege to hear guest speakers from Psychology for a Safe Climate during recent Grand Stand public forums. What helps and hinders engagement? Mending the World, a film and documentary maker and Zen Roshi. There will be catchy presentations such as The only person who likes change is a wet baby! with Dr Antony Wiliams; Brains for a Safe Climate? with psychiatrist Dr Charles LeFeuvre; and Are we up against a group of psychopaths? with Jane Morton. We also have short video from George Marshall. There will also be eminent debaters consider Does the truth about climate change motivate us to act? with Susan Murphy, Rod Quantock, David Spratt, Andrea Bunting, Lyn Bender and Jonathan Marshall. And much more – see below for details and booking information. There is a range of workshops specially designed to support those who are active in the climate movement. Please consider joining one of these creative and expressive opportunities. Leaders include Susan Murphy, Sally Gillespie, and PSC members Bronwyn Wauchope, Ben Nisenbaum, Carol Ride and Sue Pratt.